I've been a fan of Cold Steel for a while now thanks to their videos. The videos simply show them hacking up slabs of beef and pork hanging by a rope. They cut through tin cans, rubber hosing, bamboo, copper pipe, and stab into car hoods. It's a fun way to prove how strong and sharp their blades really are. 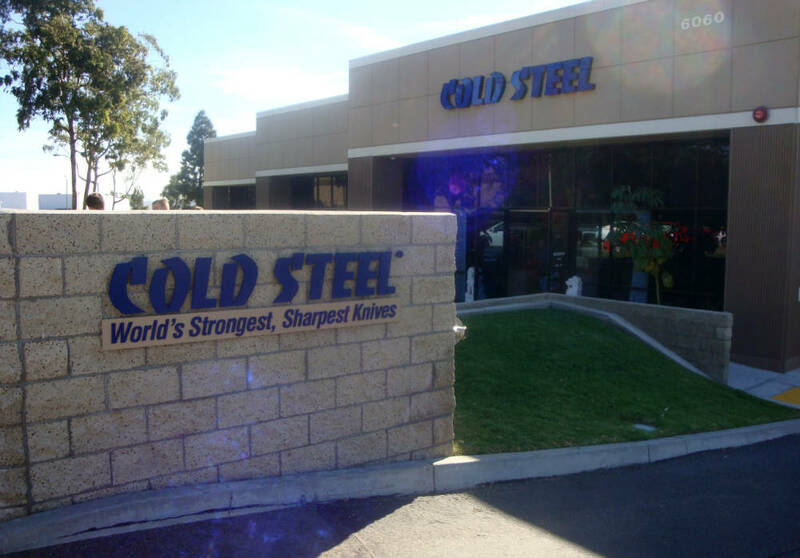 But I never owned a Cold Steel blade until a couple of weeks ago when I went to their parking lot sale. Main attraction was under the big tent! A few hundred people must have shown up over the weekend. Everyone was excited to add to their blade collection. 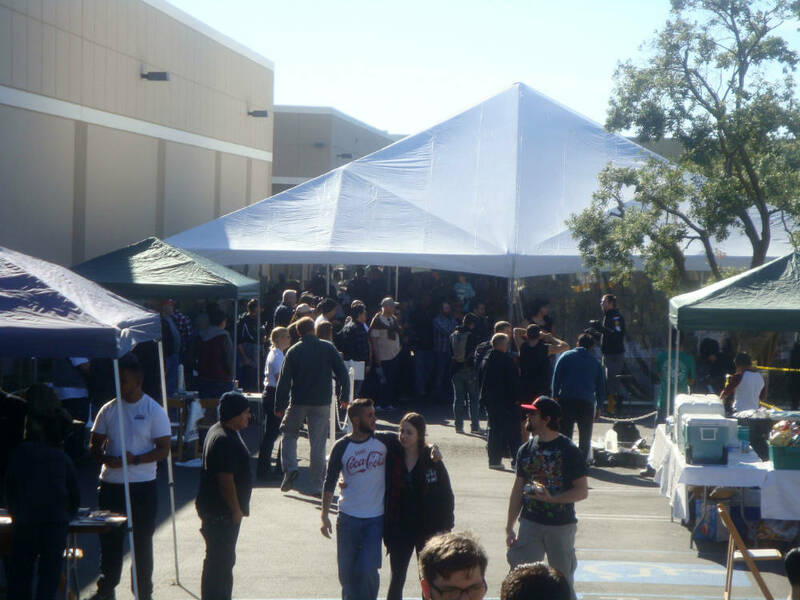 The main product exhibit was under the big tent. And, when you bought something they gave you a free BBQ lunch. 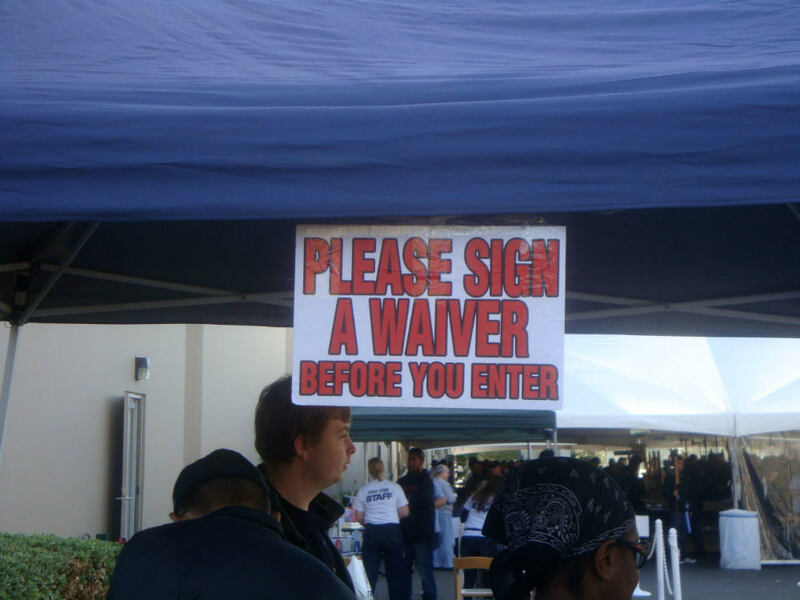 If you bought a lot, you got Tri-tip! Mmm, good. I wanted a new folding knife that would hold an edge and I could easily carry with me. It was hard to choose among all their folding knife options. 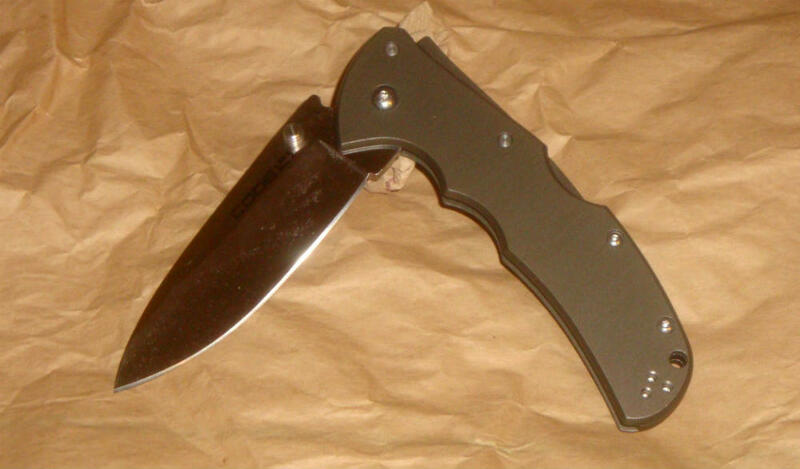 And after much comparing, and opening and closing knives, I picked up their Code 4 folding knife. I'm really happy with my Code 4. It's tough, slim, and razor sharp. It can shave the hairs off my arm. And I've already used it to cut an apple, open packages, and trim wrapping paper for a birthday present. It's perfect for everyday use; just what I wanted. 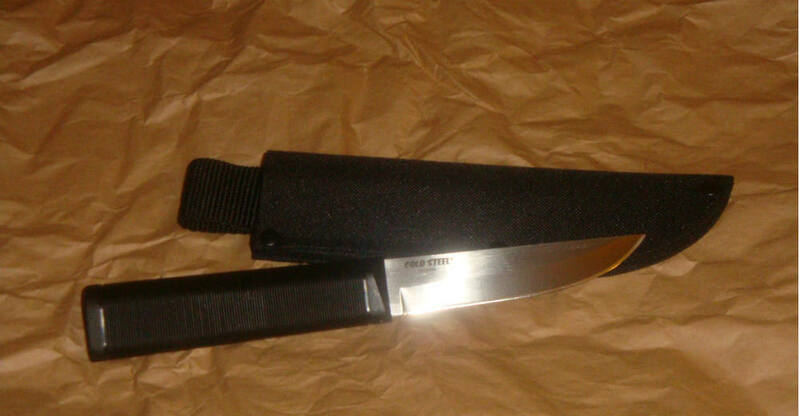 We also got a fixed blade for one of the kids. She's old enough to own and practice using a knife safely. She had a hard time choosing among all the fixed blade options at Cold Steel. She was looking for a knife to use outdoors, especially when we go camping. We finally chose their Fin Bear model. It's easy to maintain and to fix/resharpen after heavy use. And to make sure mama didn't feel like we were just "wasting" money, we also bought a couple of "practical" kitchen knives. 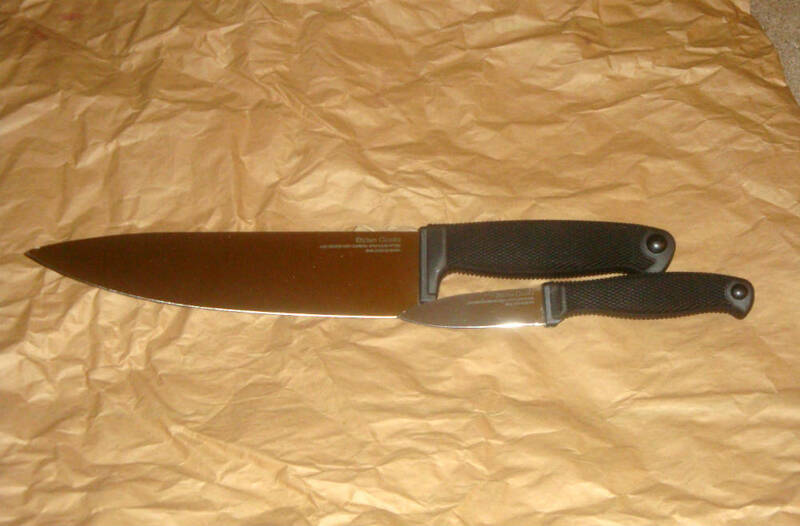 Truth is, I've been looking for replacements to the cheap, department store, kitchen knives we had. Don't get me wrong. I love taking my time sharpening and honing knives at home. Some people like to roll tobacco, others like to wax their cars, but I like polishing steel until it's razor sharp. The crazy thing is these kitchen knives are just as sharp as my folder and my kid's fixed blade. If we weren't using these to cut through tomatoes like butter, or to cut around chicken bones, I really think a doctor could use them in surgery. Great knives, and for a reasonable cost, too. 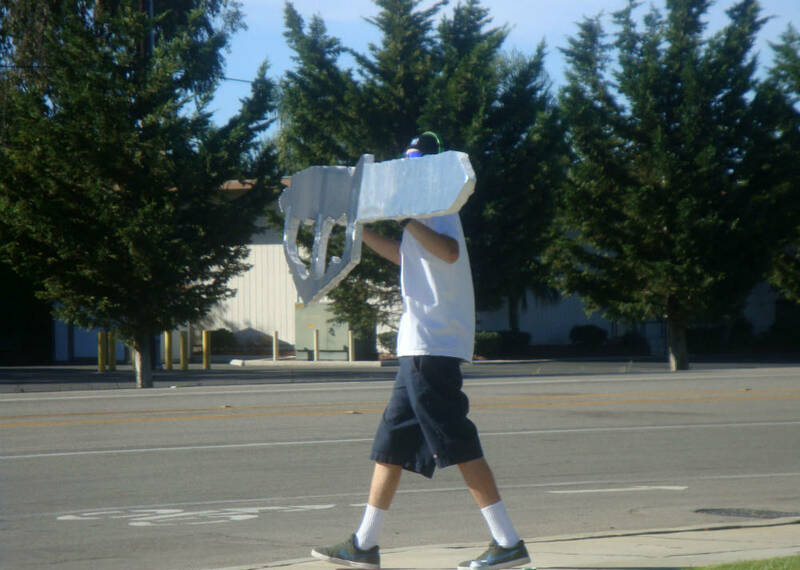 Cold Steel employs sign wavers to help point you in the right direction. Besides shopping for blades, you learn about them and how to use them. These guys below were sparring with dull metal blades. 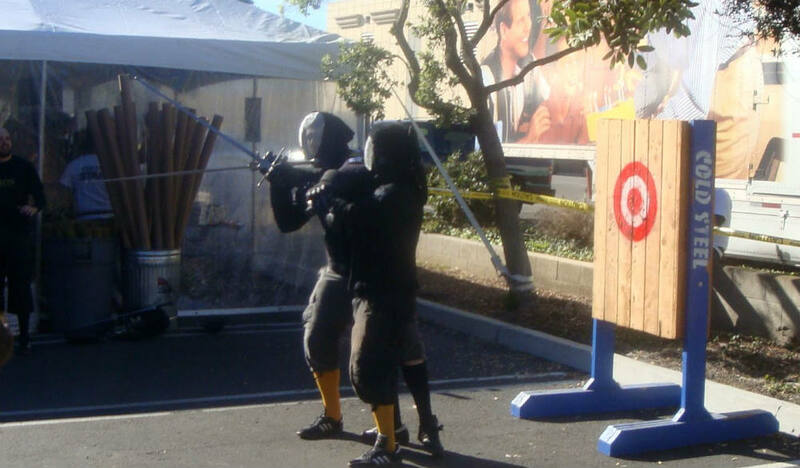 They demonstrated European sword play. And they explained the finer points of old-school duels to the death. The target to the right was used for trowing knives, tomahawks, and other sharp projectiles. Practice makes perfect. There was even a fundraiser. 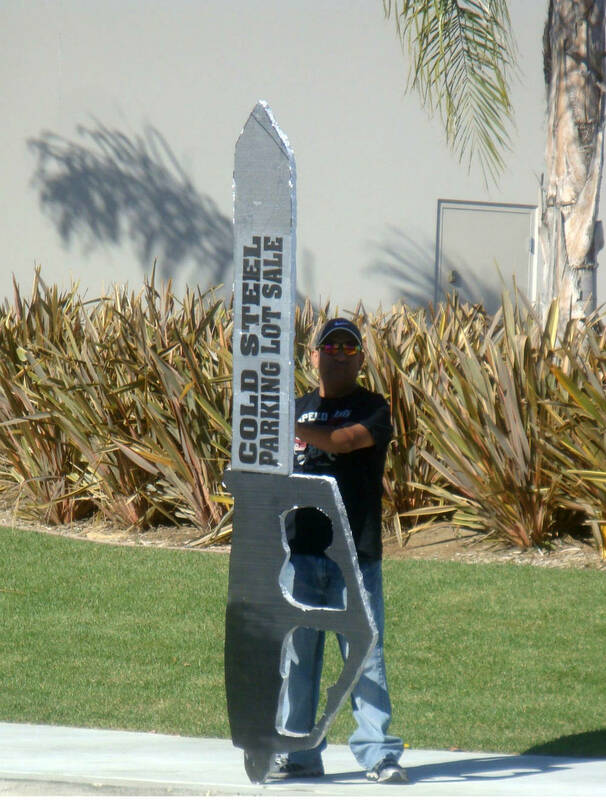 For a small donation, you could use pretty much any Cold Steel weapon to smash up a car. 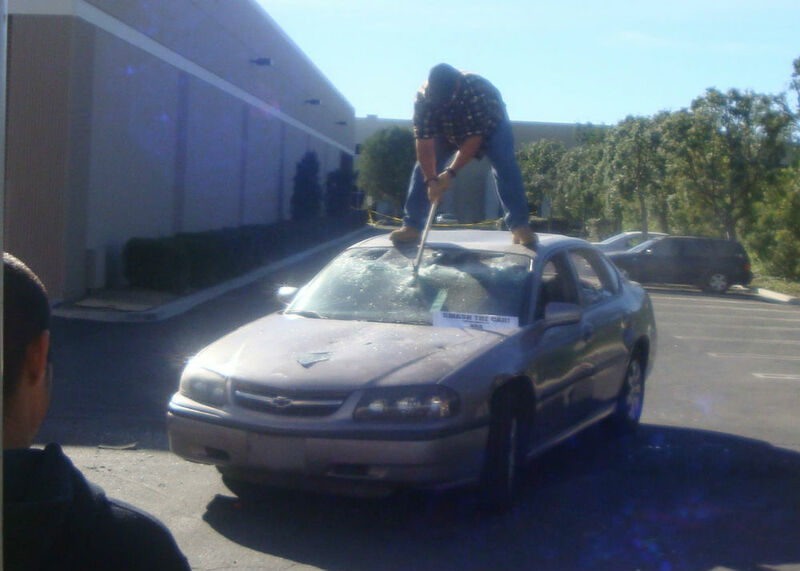 This guy used a battle axe on the windshield. 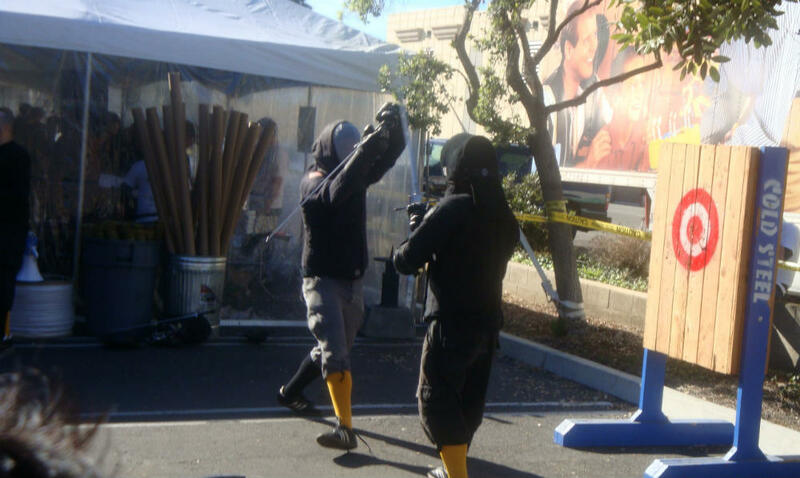 Others used swords, war hammers, and baseball bats. There was glass flying everywhere. I plan on going to future sales. I'll probably stay a little longer to watch more of the demos. Maybe I'll even donate some money to smash up a perfectly good looking car, too.